Transferring to a new college can be a little scary. But the good news is you’re in a great position to make a really smart move for your life and your career. So as you contemplate this next move for yourself, here are some things you should do. If you’re looking to transfer, there’s a good chance the college you’re at isn’t meeting you where you need to be, or maybe you’ve decided to pursue a program you don’t have access to. Whatever the reasons are, write them down. Now, make a second list of all of the qualities of your college that you do like, that you’ll miss when you leave. Both of these lists will help you clarify what you’re looking for next. 2. Look for the program you want. Many transfer students know which program they’re interested in. Talk to an admissions counselor about meeting with professors or students in that program. They can answer questions you have about the curriculum, the community, and the job prospects and internship opportunities you’ll have. 3. Use this tool to find out how your credits will transfer. Most or all of your credits should transfer from your prior institution to your new one. But each college’s transfer-credit cap is different. 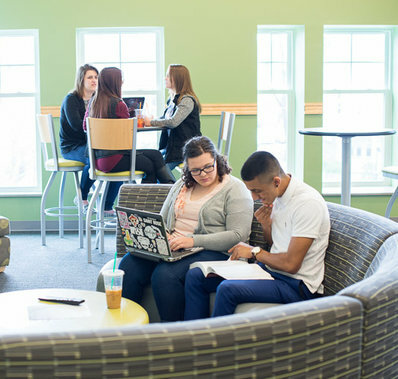 At Saint Rose, you can transfer in 70 credits from a two-year school and 90 from a four-year. And, using our DegreeWorks system or our Transfer Equivalency tool, you can get an informed estimate of how your credits will transfer. Because you’re already attending college, you know what it’s like to be a student, so you know exactly what to ask a tour guide. You know what to look for in a dining hall or a library. You’re seriously going to crush this campus visit. 5. Make sure you’ll have a support system. We know transferring isn’t easy, which is why Saint Rose has invested in our transfer-admissions team. We make sure counselors and advisors are here to coach you through the process and help you acclimate once you arrive. We don’t want to brag, but we were named a top college for transfer students. Hey, facts are facts. Wherever you are in the process, it’s easy and quick to shoot us an email. We’d love to talk to you about what you’ll find at Saint Rose. And don’t worry: There’s no pressure. Arrange to talk to us today here. We’re flexible about your schedule.